This page answers some of the questions people often ask about cremation. If you would like more information, your local funeral director will be able to help you or contact the Island Crematorium office. All the main Christian Churches, including the Roman Catholic Church also by Sikhs, Hindus, Parsee, Buddhists and many other religious and non-religious groups. Cremation is forbidden by Orthodox Jews, and Muslims. Generally the cost of a new grave is much higher than the fee charged for cremation. Are there any special procedures before a cremation takes place? Your funeral director will ensure that all the required forms are completed. If the deceased has a pacemaker it must be removed by the funeral director or the hospital mortuary technician. It is not necessary for items of jewellery to be removed. However it will not be possible to recover any items after the cremation. Certain materials such as glass, metals, electronic devices with batteries and PVC are not permitted. Can I have any kind of service I want? A religious or non-religious service may be conducted at the Crematorium within the time allowed. Alternatively you may prefer a civil ceremony or even no service at all. (2 Pieces) or arrange for a family member to play the organ or their own instrument. The first piece played as the coffin is carried into the Spiritual Space and the second piece at the committal, when the gates are closing. There are no restrictions as to the type of music played. Please inform the celebrant conducting the service of the music pieces to be played. On arrival family members may wish to carry the coffin into the Spiritual Space. The coffin is placed on the catafalque and the family will be directed to their seats after which the service will proceed. At the moment during the service when the committal of the coffin takes place the gates will slowly close. The coffin will remain behind the gates until the mourners leave the Spiritual Space. What happens to the coffin after the mourners have left? The coffin is transferred into the crematory. The name plate is re-checked by the cremator technician. An identity card accompanies the coffin and the cremated remains throughout the process until they have been collected from the crematorium by the applicant or the funeral director. The coffin is cremated and the ashes are available for collection generally after 24 hours. Before the coffin is placed into the cremator chamber the identification card is re-checked. The cremation takes approximately 90 minutes, the cremated remains are finally placed in an urn/casket or your own container. The chamber of the cremator is designed for one coffin only. Therefore each cremation is carried out separately. The crematorium or funeral director will retain the ashes for a short period. This allows the family the opportunity to make the appropriate arrangements. Where can the ashes be scattered or buried. They may be placed in a family grave, kept at home, scattered at a suitable location or at sea. If you choose to bury them in a private garden you should consider the long term implications such as if you decide to sell the house. Can I have a memorial at the crematorium? An entry in the Book of Remembrance provides a lasting and dignified memorial. The Books are in two volumes, one for each half year and are beautifully bound in mid-blue Chieftain Goatskin Leather and richly tooled in gold leaf. Applications should be made to the crematorium office. Can the ashes be sent to another area or country? 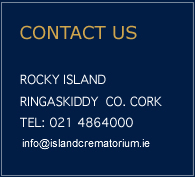 The crematorium will arrange to send ashes by courier (Ireland Only). For overseas contact your funeral director. There is a strict code for crematoria’s which is available on request. How can I make my wishes for cremation known? Inform your family and close friends or leave instructions in your will (but this may not be read until after the funeral). Contact your funeral director to discuss pre-arrangements. This allows you the opportunity to ensure that all your wishes are adhered.